Although small, the Village of Alfred is home to two college campuses, many local artists, a museum, sculpture park, eight art galleries, and a growing number of pop-up venues. These venues range from local artists and artisans, to student and alumni work, and even to contemporary work by established and emerging regional, national and international artists. Alfred Art Walk is open to anyone in Alfred- Village, Station or Town who would like to participate. 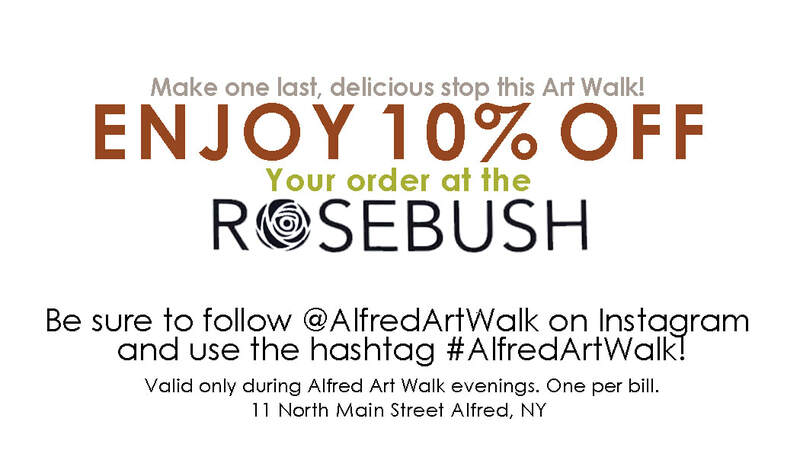 Get 10% off your meal at The Rosebush on Art Walk evenings!